Brigham Young University gave the Lady Huskies a run for their money in the first half of their Sweet Sixteen match-up Saturday. But when UConn’s Bria Hartley and Kaleena Mosqueda-Lewis came to life in the second half, beating BYU’s 6-7 shot-blocker Jennifer Hamson down the floor, the rout was on. Still, Hamson, a senior who also excels at volleyball, saw her stock rise during BYU’s NCAA tournament run. In fact, ESPN commentator Kara Lawson suggested that Hamson might have propelled herself into the first round of the WNBA draft with her performances. The good showing started in the tournament’s first round, when the Lady Cougars, seeded 12th, upset fifth-ranked North Carolina State. Hamson’s near triple double (12 points, 19 rebounds, and nine blocks), paced BYU. 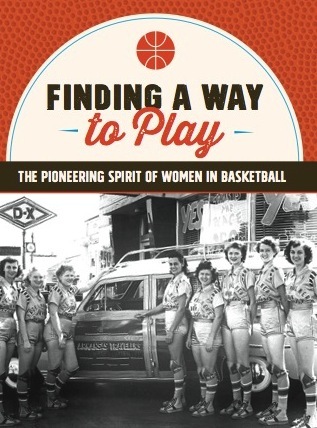 She followed that up by leading Brigham Young to an upset of fourth-ranked Nebraska in the round of 32. The Lady Cougars built a double-digit lead and then hung on for an 80-76 win. Hamson, who was playing with a dislocated finger suffered in the NC State Game, made a key layup and sank three free throws down the stretch. But it was her intimidating defense that made the difference — and it was her shot-blocking reputation (she led Division I in shot blocking with 141 blocks this season) that had UConn looking tentative in the first half of their Sweet Sixteen matchup. The fact that the Huskies’ uber star, Breanna Stewart, finally got her game back by taking the ball inside (or by sitting in the paint to draw the defense to her while her supporting cast lit it up) doesn’t take away the Lady Cougars’ accomplishments. They were only the third 12th-seeded team in the history of the NCAA women’s tournament to make it to the Sweet Sixteen. And thus far, they hold the record for keeping UConn on the ropes for the longest stretch. (UConn was down 35-34 with 17:34 left — the latest it has trailed this season). In a year when UConn has been so incredibly dominant, hanging with the big dogs for 23 minutes is a rare feat — and definitely something of which to take notice. And in a year when the WNBA draft is not studded with big stars like Britney Griner and Elena Della Donne, Hamson, the West Coast Conference Player of the Year, could possibly find herself moving up the list and being snagged in the first round by a team in need of an inside presence. That would present Hamson with a dilemma, though. 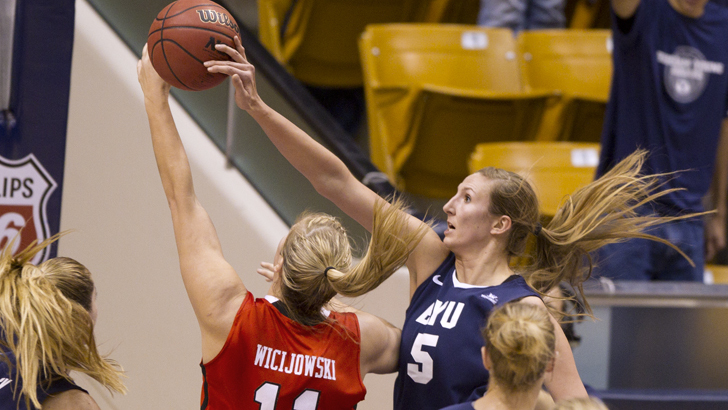 In her first three years at BYU, she played volleyball in the fall and basketball in the winter. This year, however, she red-shirted herself in volleyball so that she could concentrate on training for basketball as soon as she returned to school in the fall. While that tact certainly seems to have paid off, Hamson has another year of eligibility in volleyball and as recently as Febuary said she plans to honor her commitment to come back and play volleyball next fall. Will a WNBA team still draft her and attempt to change her mind, or retain the rights to sign her for 2016? In a WNBA draft where the only legitimate centers are CT’s 6-5 Stephanie Dolson and Kentucky’s 6-3 DeNesha Stallworth, who wouldn’t take a chance on a 6-7 shot blocker? Especially one who has proven she can play with the NCAA’s big dogs.